My middle nail ripped badly in my sleep : / So I shortened them all. I'm very thankful that my nail beds are kinda long. I really dislike my nails this short hopefully they grow fast! 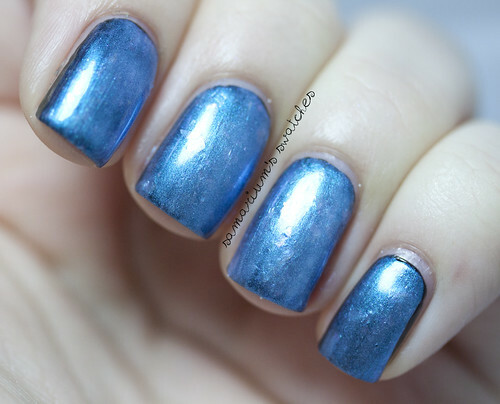 Three thin coats-perfect formula! Dried very fast! Same as Zomboy! Three thin coats, dried very fast and wonderful formula as usual! Oh well! I know I will use them all year anyway! Hey guys, how is your day/night going today? 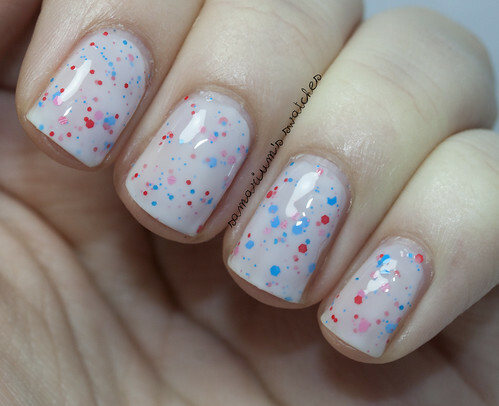 Today I have a mani from last week, I did some colorful sponging to use OPI Spotted over! First here was the initial look. And here it is with OPI Black Spotted layered on top! 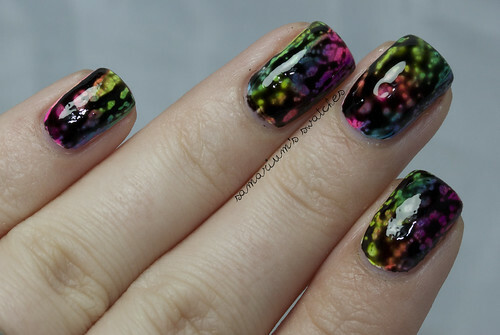 I really loved this mani <3 Sorry about the pictures, especially of Spotted. I was, admittedly in a rush at the time and the photos could have looked better. 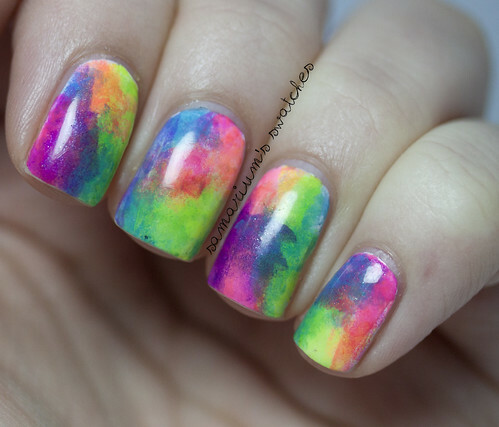 Color Club-Poptastic and Wham! Pow! And of course OPI-Black Spotted! 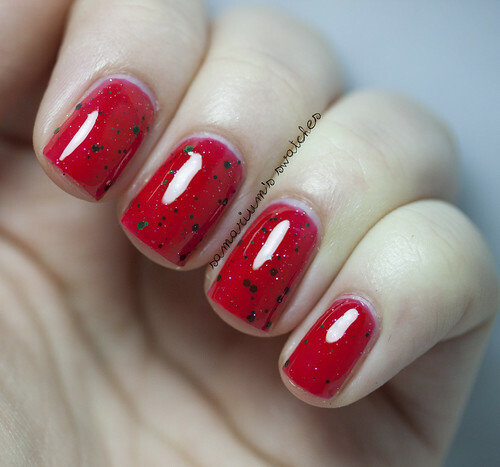 Jindie Nails Santa Claws Collection Part 2 Swatches & Review! Hey all! 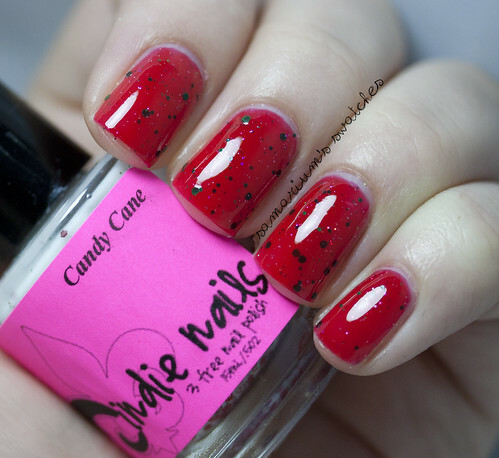 Who loved the first part of my Jindie Nails Santa Claws Collection post? 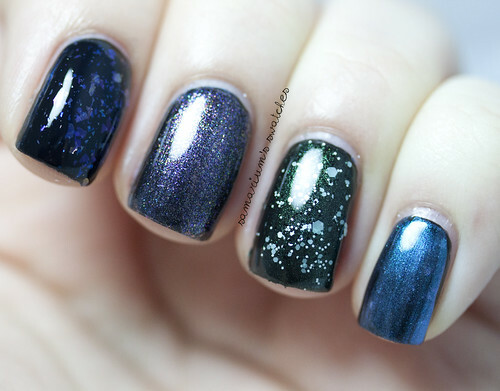 These polishes are all so pretty!! Between the two posts I have 7 of the 9 in the collection to show you! 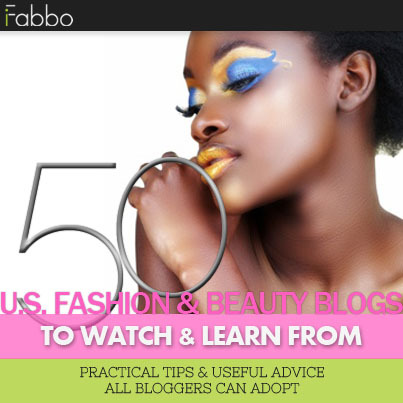 If you missed part one here it is! Plus her new labels are really pretty! But sorry if that causes any confusion! Kiss Me Under the Mistletoe, Noel, and Silent Night. 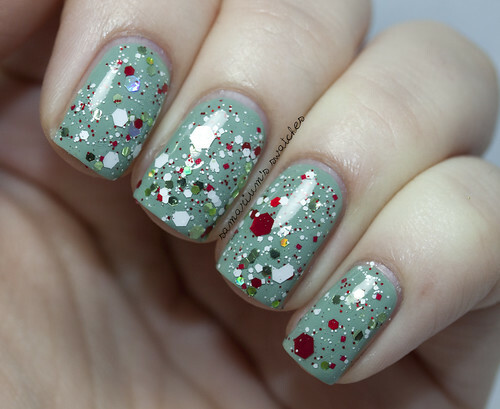 Green & white matte hex with larger matte red hex and dark green shimmer. I layered two coats of Holly over Essence-Irreplaceable. Which I think is a great combo! This applied really evenly and easy! Could use a tad more red hex, but it's gorgeous! True red jelly with green matte hex and green sparkle hex. 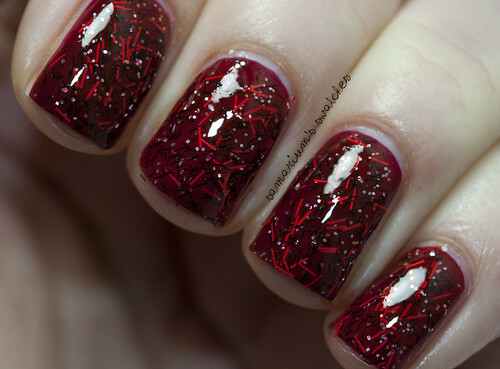 I used three thin coats of Kiss Me Under the Mistletoe I love this polish! 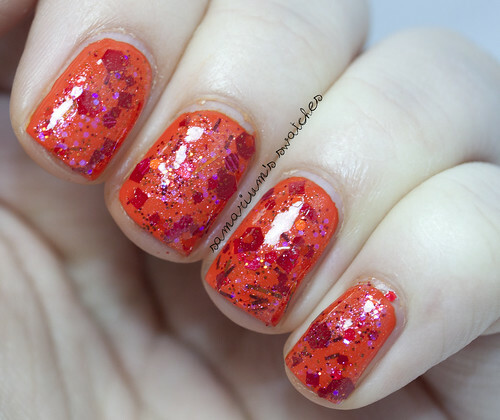 Crazy easy application, the glitter dispersal is spot on! But I would probably say that the first two are more color accurate, but it is more in between both. 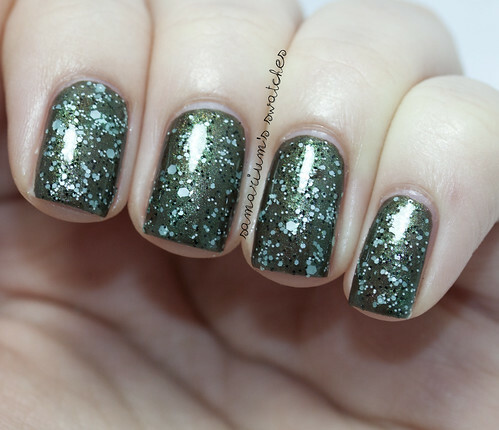 Red, white, neon green, ultra-fine matte hex glitters, with metallic green sparkle. I decided to layer one coat of Noel over Butter London-All Hail the Queen. 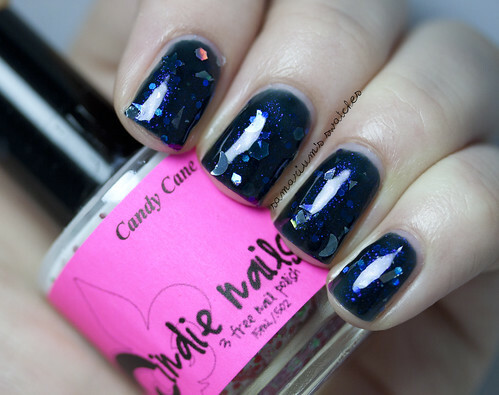 I loveee matte glitter so this is a favorite! It is very dense, but applies insanely evenly. Only needs one coat of TC to be smooth. 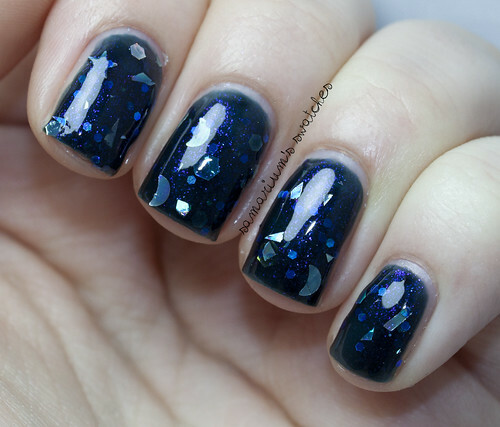 A deep blackened navy jelly polish with purplish-pink shimmer, holo moons, stars, & hex. This polish is great! It is thick, but somehow it was still pretty easy to apply. Application wasn't the easiest ever, but far from difficult. I just love the glitters and shimmer in this. I wore it for days with zero tip wear or chips! The Santa Claws Collection will be available for purchase on Nov 1st on Jen's Etsy Shop! Her awesome polishes are 3-Free and She ships Internationally! Don't forget to follow Jen on Twitter, Facebook, and Instagram! You can purchase Full Size for $7.75 and Mini's for $4.75. Who else can't wait for the holidays?!? 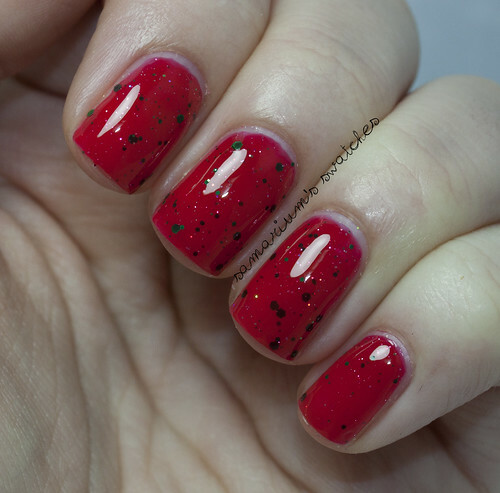 Jindie Nails Santa Claws Collection Part 1 Swatches & Review! Hey guys! 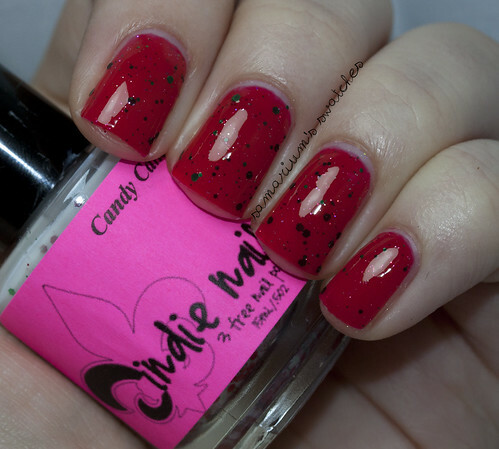 I have part of the Jindie Nails Santa Claws Collection to show you today! I decided to split it into two because It's a lot of photos! But no worries-the other part will be up tomorrow! A little but early for Christmas for some, but not for me! My favorite time of the year is coming! "White creme/jelly base with cherry red matte and metallic hex and some metallic green hex with a green sparkle." I love this polish! The application was so smooth and easy! I used three thin coats, they dried really fast too! I only got one big red hex applying normally- so you may have to fish for them a bit. 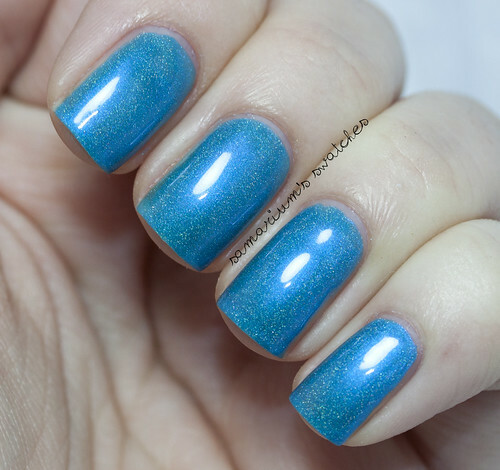 "Deep turquoise blue shimmery holographic polish." This polish is magical. 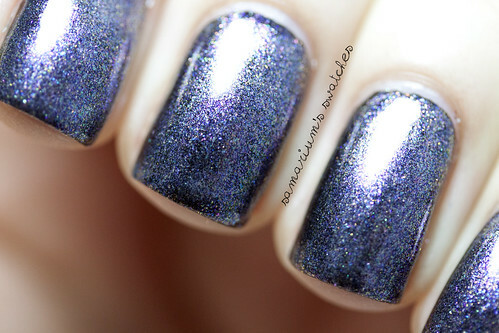 <3 It isn't a plain blue holo, it looks as if it illuminates. I used three thin coats. It's mesmerizing! Oops! 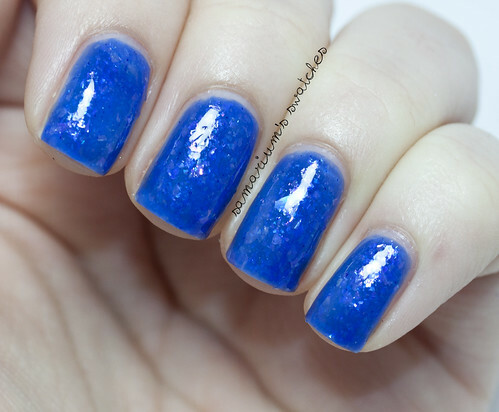 Jen told me she sent the older version of Blue Blue Xmas and meant to send the new one, the newer version is more holo! But she may make this version available for purchase later on! She is going to send that to me and I will post swatches for you when I get it! I have two pairings of Just Elfing Around, this first one is over Blue Blue Xmas. I used two coats, well more like one and a half- one coat plus some dabbing. "Pastel green, white, cherry red hex plus silver and lime green holo hex." I used one coat, then I dabbed on some more in a few places. Over Zoya-Bevin. Really nice combo, I loved this a lot! The glitter disperses pretty darn evenly but I did dab on a bit to even it out. The Santa Claws Collection will be available for purchase on Nov 1st on Jen's Etsy Shop. I hope you guys enjoyed these-I can;t wait to show you the rest!! A England Ascalon and Dollish Polish What's This? What's This? Hey guys! Really simple mani, and quick post for you atm. 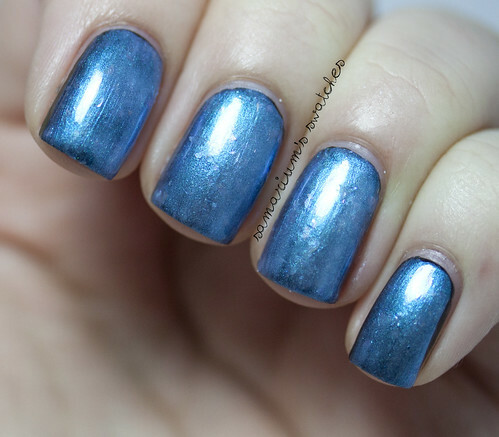 Dollish Polish-What's This? What's This? 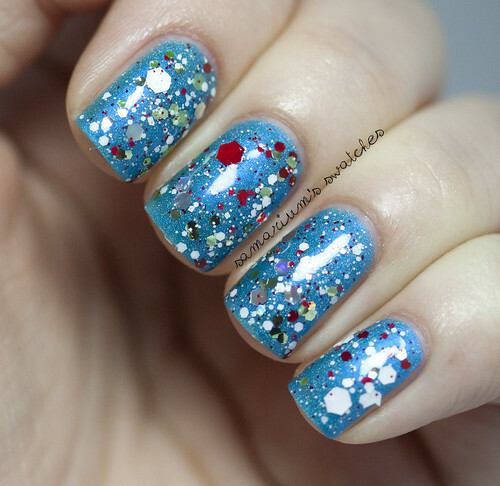 on my accent nail. Simple but I loved it! Ascalon is one of my very favorites! Trying to try out all of the Halloween polishes I bought. Which was too many! How is everyone's week going? 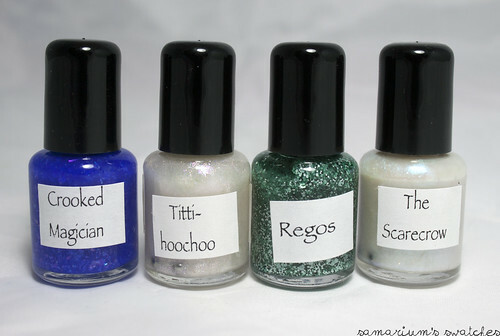 A Rhyming Dictionary Polishes- Crooked Magician, Tiiti-hoochoo, Regos, & The Scarecrow Swatches & Review! 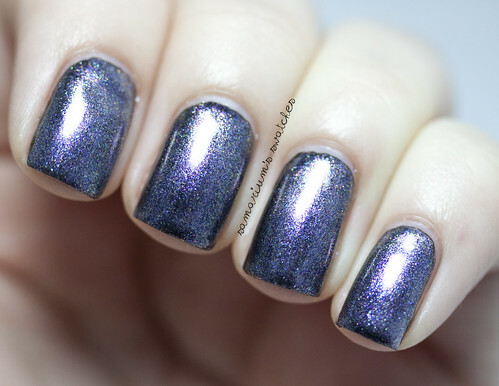 Today's post is another review from indie polish maker Morgan, from A Rhyming Dictionary Polish. (From L-R) Crooked Magician, Titti-hoochoo, Regos, and The Scarecrow. Staring off with the most beautiful!!! 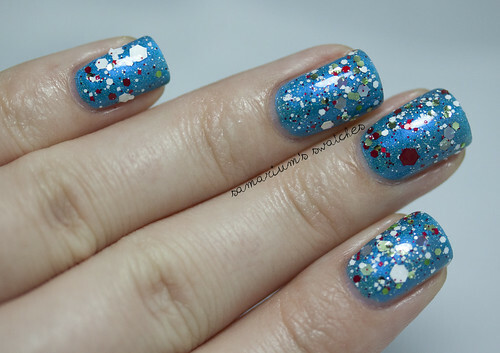 A bright blue jelly polish with rainbow flakies. 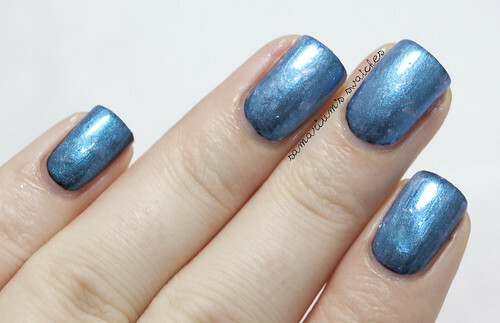 Guys, I am so in love with this polish-You have no idea. I decided to build it up. 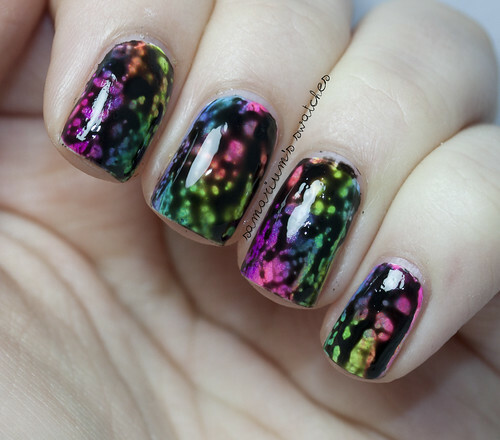 It's a jelly and takes four coats to opacity, which I realize sounds like a lot. I dislike having to do over three almost ever. 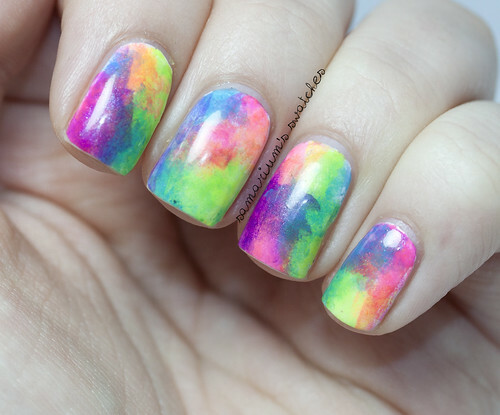 This polish is an exception. The beautiful depth you get with this, ugh I mean just buy it. I love blue and I really love jellies. This is perfect. So effing gorgeous!! You can also layer it over black, which is shown further in this post. No exaggeration though, I think this is one of my favorite polishes I got this year! A pearl with color changing pigment. Over black it looks reddish-purple but it was many different kinds of pigment so it will look a little bit different over every color. 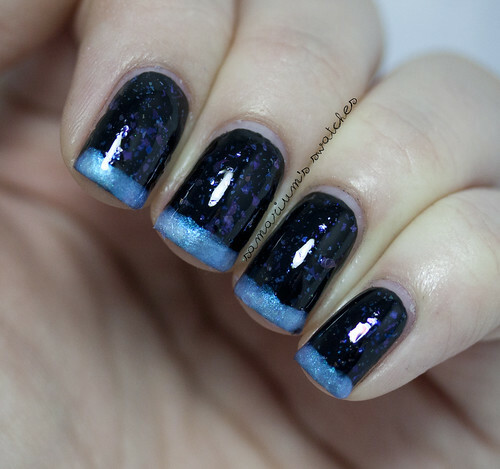 For the first two photos I used two thin coats of Titti-hoochoo over black polish. For the last two I used two thin coats over Opi-Vampire State Building. 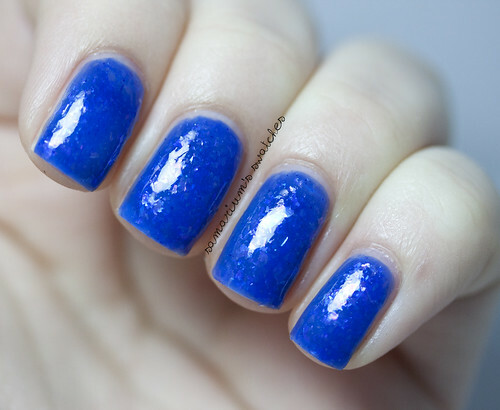 This is a really pretty layering polish, I would recommend buying the larger bottle though. I believe it would be easier to have even coats with the larger bottle, I just have a hard time with mini's getting as evenly as I would like. Tiny black, white, and mint hexes with larger mint hexes added in with a green tinted base! Two very thin coats of Regos over of SpaRitual-Lithophonic. I really lover this one-probably my second favorite of the bunch! 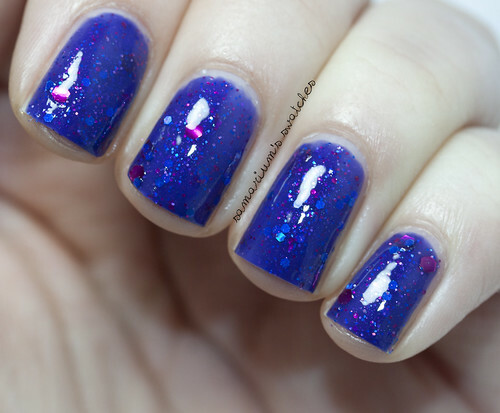 A blue color shift top coat with purple iridescent flakies. 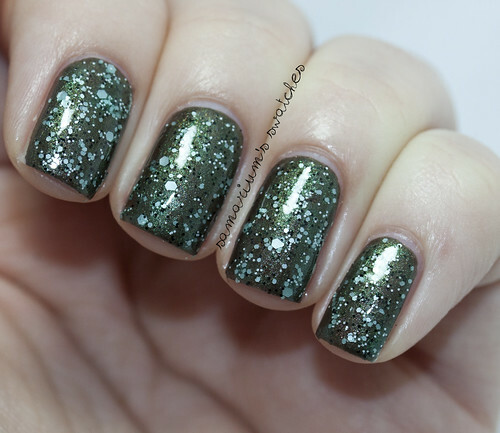 This is another polish I highly recommend buying a full size bottle of it you like it. It was pretty difficult for me to try to get even coverage, and I think the mini had to do with that. I cannot be certain, but I do think that is why it was hard for me. 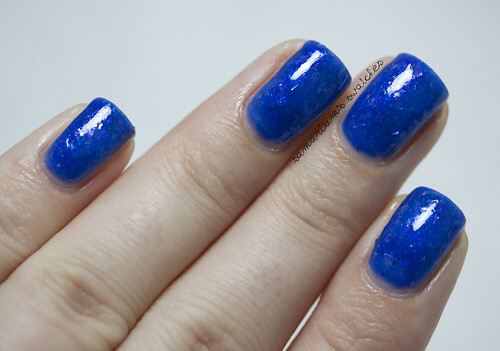 This polish is really pretty, but my least favorite. No particular reason I can think of. I don't wear a lot of metallic polishes often-maybe that is why? I used three thin coats over black. From L-R- One coat of each over black. Crooked Magician, Titti-hoochoo, Regos, & The Scarecrow. Here is a mani I did with Crooked Magician & The Scarecrow over black. You can purchase Morgan's polish from her Etsy shop HERE!!! Follow A Rhyming Dictionary on Facebook, Twitter, and her Blog. 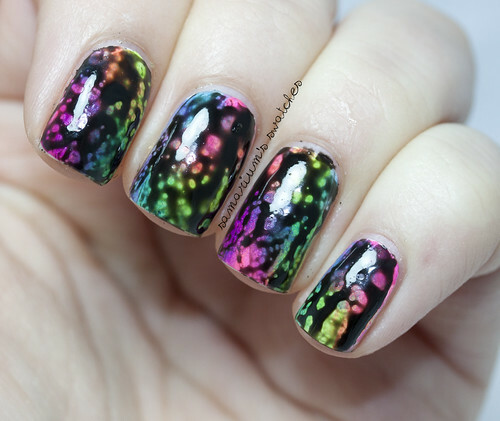 Nail Art Inspired by my New Blog Redesign! 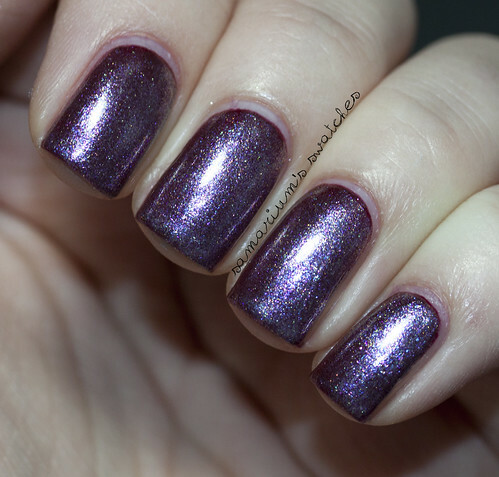 Fanchromatic Nails Swatches & Review!